From 12 to 16 May, the Americas Workshop on Linear Colliders (AWLC) 2014 was held at Fermilab in the US. AWLC is one of the series of regional linear collider workshops held around the world. 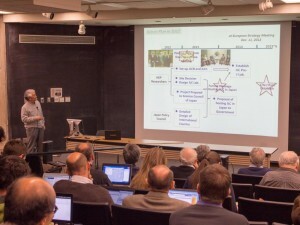 The purpose of this workshop was the continued development of the physics case, and advancing detector and accelerator designs for a high-energy linear electron-positron collider. This meeting particularly addressed the developments for the International Linear Collider (ILC), which Japan is showing the interest to host. Even though the scale of the workshop was rather small, with about 300 participants, I believe that this meeting was significant. It was the first meeting after the completion of the LCC-ILC accelerator organisation chart, presented by Mike Harrison, the LCC-ILC director in the opening plenary session of AWLC. 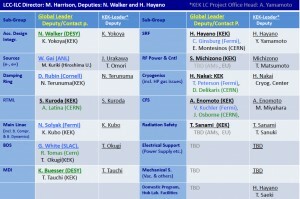 This chart lists the group leaders and also KEK’s group leaders for 15 technical sub-groups, such as accelerator design, superconducting radiofrequency, or cryogenics. You may think it is just a chart, but I believe it is one of the most important proofs of progress of LCC’s strategic planning since its establishment in February 2013.
and responsibilities on the running projects at their own laboratories. To get their working time for the ILC, we needed to establish the official structure approved by each laboratory. This had not been an easy job, but it was made possible by in-depth, multiple communications between labs and LCC. Because we have this chart completed, many younger researchers at KEK who will lead the real ILC construction work could attend the meeting. They made important presentations, and their presence made the discussion truly substantive. LCC also welcomed five sub-leaders from CERN on the chart. This is a significant change from the Global Design Effort, the former organisation promoting the ILC, which did not have multiple involvement of CERN. Their official participation will also work as a driving power for the realisation of the ILC. Many impressive reports were made in the workshop. The presentation which impressed me the most was the development at the Accelerator Test Facility (ATF) at KEK laboratory, Japan. ATF is a test accelerator focused on generating the super low-emittance beam that is one of the essential techniques to realise the ILC. The scientists at ATF are working on the technologies to squeeze the beam to nanometre scales. The target size is 37 nanometres. Because of the difference in the energy between ILC and ATF, a 37-nanometre beam size at ATF is equivalent to the 6-nanometre beam at ILC. They reported that they have realised a beam size as small as 55 nanometres, and the record is improving. They did not only realise the very small size but are also showing high reproducibility, and this is really important progress This means that the technology is becoming increasingly convincing. Another impressive technological advancement is that of superconducting radiofrequency (SCRF) systems. In the past we used to experience the degradation of the performance of the superconducting cavities. When the cavities were assembled into the system, their performances were lowered by about 10 percent on average. But now, both DESY in Germany and Fermilab accomplished good records, and the degradation fell within the five percent range. At KEK, most of the cavities are showing good performance of accelerating gradients and exceed the ILC specification, and we are expecting a good result of the system test in this autumn. Laboratories around the world are producing a steady flow of successes. This is very encouraging evidence that our study is succeeding. And also, it means we are entering the next stage. When the technologies are immature, making big advancement is easier. Now, the technologies have matured, advancing another step will become harder. We need to strive more than ever. While we see the steady technological development, the politics around the ILC isn’t so easy. As Atsuto Suzuki, Director General of KEK, said in the closing session: since when Japan has been getting the primary candidate position for hosting the ILC, the general assumption for the contribution sounds to be setting back to the Japan Linear Collider (JLC), the old linear collider initiative planned as a national project. Many people asked us when Japan will give a go. Of course, Japanese researchers need to make their very best effort to realise the ILC, but “ILC” should be really a global project in appropriate balance of contribution. We do need strong global support to get a go sign. It is very encouraging to receive positive message from United States in the P5 report. I would like to thank the committee member’s long-term and hardest effort to reach this report. This surely will be a push for the realisation of the ILC in Japan.